Our work examines biological systems through the prism of Soft Matter and Statistical Physics. By properly exploiting their symmetries, we strive to make robust statements that give valuable insights into the mechanics and thermodynamics of these complex living objects. Although this work is theoretical, we are fortunate to have numerous fruitful collaborations with experimentalists. In the following the names of experimental collaborators are italicized. Earlier research projects are described here. F-actin is a central component of the cytoskeleton, a network of filamentous proteins that confers the cell many of its mechanical properties. 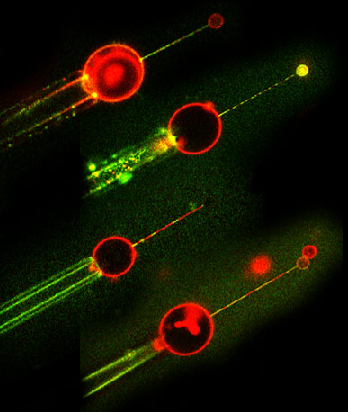 Depending on its location within the cell, F-actin forms a variety of structures ranging from highly entangled networks to straight bundles of well-aligned filaments. We study the competition between entanglement and alignment in in vitro F-actin networks in the presence of actin polymerization and cross-linking proteins, as well as other actin remodeling agents. Due to the long time scales involved in the rearragement of the actin gel, ill-understood out-of-equilibrium effects dominate its morphology. We seek to understand these fundamental determinants of the cellular architecture. In addition to contributing to the static architecture of the cell, F-actin can power its motion by polymerizing and exerting forces in the direction of its movement. The networks involved in this process have a distinctive branched architecture, and are among the stiffest actin assemblies found in the cell. Despite the importance of their mechanics, however, the rigidity of these networks is not well understood from a theoretical standpoint. 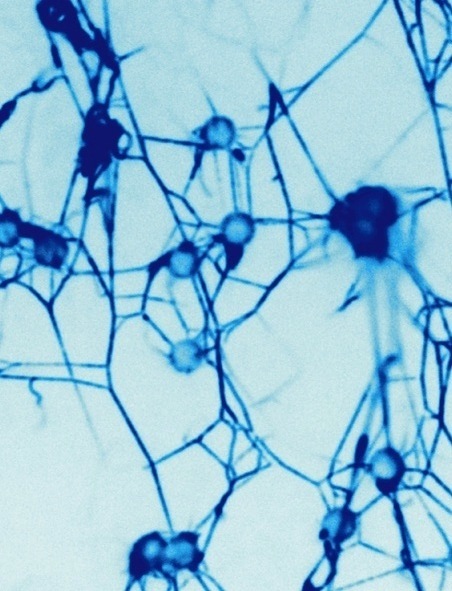 We examine the origin of this rigidity, and study the way in which the resistance of the extracellular medium that the network grows against influences the mechanical characteristics of the cell. 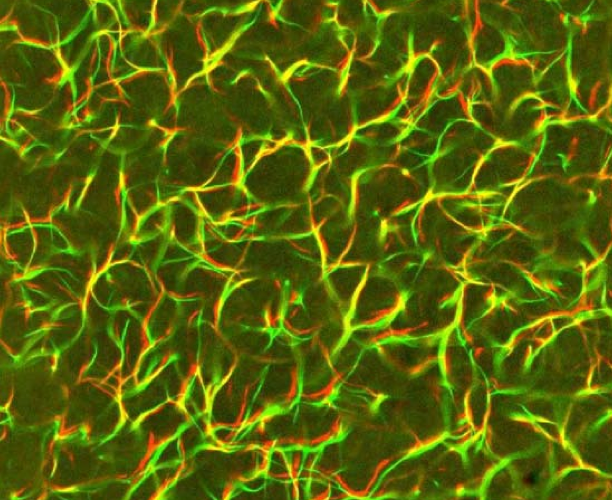 This helps us understand how the internal architecture of the cell tunes itself to adapt to its mechanical environment. Contractile in vitro actomyosin bundles studied in collaboration with Gardel's experimental group. Cellular movement heavily relies on contractile structures within the cytoskeleton made of polar filamentous actin (F-actin) and the molecular motor myosin. Some of them are very ordered (e.g., our striated muscle), and there contractility arises straightforwardly from the geometrical arrangement of the motors and filaments according to the well-established "sliding filament model". More broadly, it is often assumed that this mechanism is more or less universally applicable to contractile actomyosin structures. We question this dogma and show that the mechanisms at work in structures lacking muscle-like organization are less trivial. We investigate the mechanisms at work there, which could play an important role in many in vivo structures lacking sarcomere-like organization such as smooth muscle, graded polarity bundles, the cell cortex, the contractile ring, contractile lamellar networks, etc. Device used in the Roux group to control force and membrane tension in a dynamin (green)-coated membrane (red) tubule. Eukaryotic cells are enclosed by a thin, impermeable lipid bilayer. 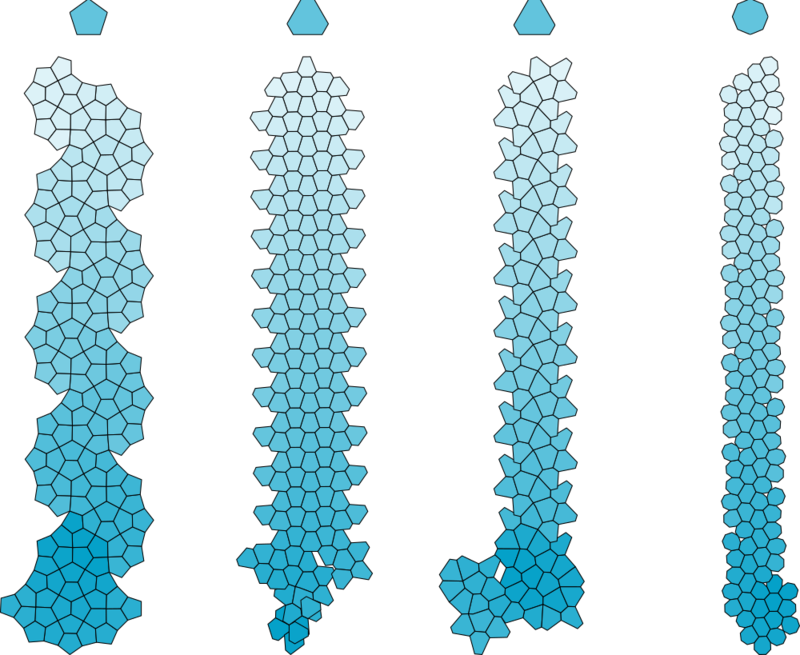 To allow vital exchanges with the outside world, specialized proteins must constantly tubulate, cut, deform, and fuse compartments made of this membrane. Although the study of these complex molecular machines is traditionally focused on understanding the biochemical mechanisms underlying them, we consider the interplay between the geometry and thermodynamics of a range of coupled protein-membrane systems. In particular, we study the dynamin and clathrin proteins as well as the ESCRT-III complex. We show that the mechanics of the lipid bilayer has a strong influence on their function, implying strong constraints on the way these proteins remodel cellular membranes. Engineering a material is not limited to making it hard or soft depending on its intended use. For instance, compounds that resist if probed over a short time but flow over long times are valuable as they can heal themselves if scratched. 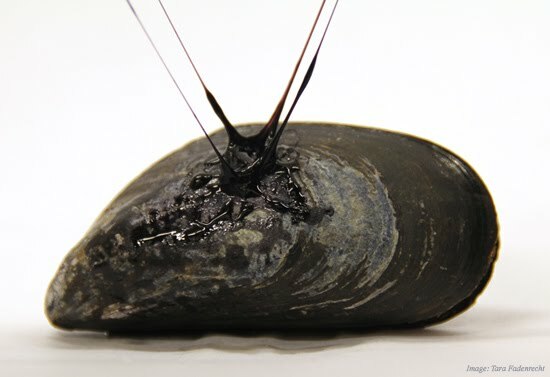 While it has traditionally been challenging to independently control the rigidity and time response of polymer materials, we investigate a type of gels inspired by the stiff threads that anchor mussels to rocks. There, multiple highly tunable metal-ion bonds allow direct control over the different time scales involved in the gels' response. We use theory to understand how the different metal ion concentrations give rise to the material's overall properties, allowing optimal progress towards the desired material properties as well as a deep understanding of the design principles of the resulting product. Protein fiber formation is involved in many diseases including Alzheimer's, sickle cell anemia and type II diabetes. Although this behavior has been attributed to the specific physico-chemical characteristics of proteins, we propose that this behavior can be expected from a broad class of aggregating objects. Indeed, while simple objects such as spherical colloids tend to aggregate into three-dimensional crystals, such a regular arrangement may not be compatible with particles having a more rugged geometry. We thus propose that under certain conditions, fiber formation could be a generic characteristic of attractive irregular objects with short-range interactions.